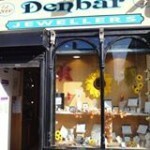 Short Business Description: Denbar Jewellers specialise in Diamond Engagement Rings & Wedding Bands. We stock many luxury brands such as Paul Costelloe, Emozioni, Noriko Pearls, Tipperary Crystal Jewellery, Shira Designer Jewellery & many more…………. Denbar Jewellers specialise in Diamond Engagement Rings & Wedding Bands. A) Receive 30% DISCOUNT on your Engagement Ring. B) Receive 20% DISCOUNT on your Wedding Rings, when his & her rings are purchased from us. C) Receive FREE Polish & Rhodium plating of your Engagement Ring, prior to your Wedding Day. D) Receive a FREE, PERSONALISED Wedding Coin, a keepsake of the most special day of your lives. We at Denbar Jewellers are rich in experience & product knowledge & guarantee you the very best advice, in a very welcoming, friendly & relaxed atmosphere. We look forward to you calling to us & allowing yourself to enjoy the Denbar experience! A family-run jewellers since 1897. The ideal venue for all your gift and jewellery needs.